Since its inception in 1994, Ashkal Alwan has become an international platform for the creation and exchange of ideas around artistic practices and educational processes. Having initially committed its resources to introducing the work of artists who were working within, and following on from the events of post-war Lebanon, the organization has since developed residencies, a research hub, public and civic projects, and an extensive education programme. One of these projects, Home Works Forum (HWF), launched in 2002, has since evolved into a pre-eminent platform for research on cultural practices within the region and beyond. Another project, launched last year under the name Home Workspace (HW), is a multipurpose facility dedicated to research, production and education in the context of contemporary artistic practices and debate. 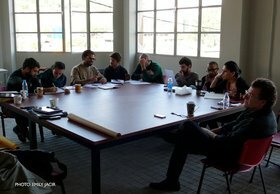 Housing production and editing studios, performance spaces, auditoriums, and Lebanon’s first multimedia library for contemporary arts, Home Workspace is dedicated to developing an interdisciplinary approach to arts education in the Arab world. In this conversation with Anthony Downey, Christine Tohme, founder and Director of Ashkal Alwan, talks about the ideas behind the organization and the gestation period leading up to the launch of Home Workspace last year. Focusing on its approach to issues around education – specifically, the introduction of pedagogic models that refute traditional educational paradigms – and collaborative artistic practices, Tohme notes how the organization as a whole is an ‘accumulation of ideas and people’ dedicated to collective projects and, in turn, an engagement with the ‘intersection between the artistic and the civic’. Noting that the current crisis in our ideas of Modernism are not just based in financial concerns, Tohme observes that as producers we can revisit the meaning of Modernism and ‘contest the uses of public space and civic consciousness to no other end than profit’. AD: To a certain extent then, this is about tapping into a potentiality that may have been latent for want of space but also a horizon; it’s about figuring a horizon which you are working towards as an ongoing project? CT: Yes. It is a horizon and a challenge but it is also a space; which, as I have mentioned, affects your way of thinking and also leads you to think of certain possibilities and future projects. You can plan but also imagine. And that is why spaces affect your practice and train of thought because once you are in a space, you understand that it leads you towards something – and this is what happened with Home Workspace. In many instances we had set ideas about the space and how we were going to use it and these got changed over time; they became more fluid. We decided that the space was going to be used for artistic projects and it would be also used as a social hub – a space for people to get together, eat together, drink together, play ping pong together, cook together, party together … This is why a space leads you. You live with a space and you live through a space. The actual refurbishing was conceived by Youssef Tohme (no relation) who was also responsible for the new campus of Beirut’s Saint Joseph University. The organization of space itself has allowed us to continue thinking about how we engage with the idea of education – although I am very critical about this word ‘education’ because I don’t believe in educating people. AD: Could you elaborate upon that? When you say you don’t believe in educating people, you obviously don’t mean that people should remain uneducated. CT: I think that you give people possibilities and in that moment you give them the means to take these possibilities and concentrate and facilitate further ideas inside of an environment. Space, in that sense, is a situation for furthering the production of ideas, but I don’t believe that you could ‘educate’ people because it holds within it the ideal of changing people, or improving them, which has become a recurrent gesture in our time. AD: We could push that idea into a discussion of books such as Jacques Rancière’s The Ignorant School Master: Five Lessons in Intellectual Emancipation (1991). CT: We have a committee that invites an artist every year to be the resident professor, and this resident professor puts forward the theamatics for the year’s curriculum and invites artists, scholars, writers and philosophers to be with the participants in Beirut. 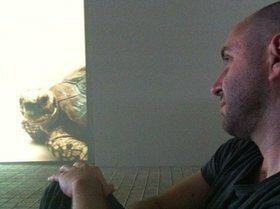 For example, this year we have received Franco Berardi, Kamran Rastegar, Hassan Khan and Alfredo Jaar. Additionally, we have visiting artists who pass through the city and we ask them to meet with the participants. 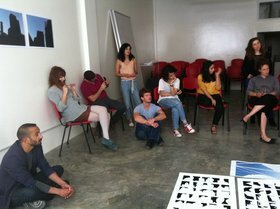 We also have mentors, who are artists based in Beirut, and they work closely with each participant on their projects. Joana Hadjithomas has done this as have a number of other artists, such as Lina Saneh, Lamia Joreige, Akram Zaatari, Walid Sadek, Tony Chakar, Tarek Atoui, and Mirene Arsanios among others. Next year, the theatre director and dramaturge Matthias Lilienthal will oversee the program. We have a theme that is on the website and he is inviting visual artists, performers and theorists, which we will announce shortly. The program will be focusing on formats, and will include Lilienthal’s X-Apartments project, which he plans to realize in Beirut in collaboration with participants. Each professor or artist or practitioner who comes is therefore like the architect of the programme. CT: I really don’t know what to tell you. I really don’t have an answer. We are still at the beginning of the road in this programme and it is still too early to say where we are or what we are going to change. I am sure that through this process we as an organization are already changing – and perhaps that is what this process is about, change – but it is too early to say what the future process of change will bring and where it will ultimately direct itself. CT: I don’t believe in cultural translation. CT: Yes, we do that all the time. We have just released a bilingual book of Rabih Mroué’s performance pieceHow Nancy Wished That Everything Was an April Fool’s Joke (2007). The piece, which is about four characters/ combatants who recount their experiences in Lebanon’s civil wars, was co-produced by Ashkal Alwan in 2007, and was banned initially by the General Security censors in Lebanon for fear of ‘rekindling civil strife’. The play was eventually granted permission to be presented uncensored, after considerable campaigning from the Lebanese press and the intervention of the then-Minister of Culture Tarek Mitri who submitted it to the Council of Ministers’ itinerary. The book includes the original script in Arabic co-written by Mroué and Fadi Toufiq, and a translation into English by Amal Issa, as well as the posters by Samar Maakaron that appeared in the original production. It was very important for us to include the story of the play as a text that passed through the censors – what happens to a text when it goes through this journey, and also within the context of the possibility for national histories or historical narratives. The play contains several references, accurate and inaccurate, to actual events and battles, and it is this impossibility or freedom from presenting an accurate or authoritative account that make this such a strong play for me. Likewise with the translation, it was the impossibility or freedom from presenting a true translation that was the point of departure: translation is impossible and it’s something you have to travel with, and this is what we aim for when we work with translation. Christine Tohme is an independent curator, cultural producer, and founder/director of The Lebanese Association for Plastic Arts, Ashkal Alwan – a non-profit arts organization established in 1994. Since its inception, the association has committed itself to the production, facilitation and circulation of artistic practices across a wide range of disciplines and media. Ashkal Alwan’s platforms include the Home Works Forum on Cultural Practices, curated projects in Lebanon and abroad, the publication of literary works and artists’ books, residency programs, art production grants, and a monthly newsletter. Ashkal Alwan has also supported the documentation of an unprecedented archival record of contemporary intellectual and creative endeavors, available through its public research archive. Through these initiatives and others, the association has established itself as a reference within the cultural landscape of the region and beyond. 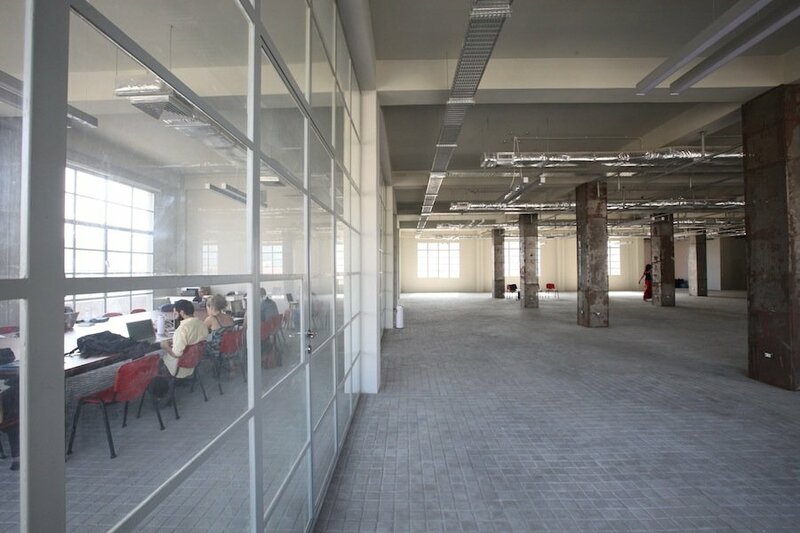 In 2011, Ashkal Alwan launched Home Workspace, a multipurpose facility in Beirut dedicated to promoting an interdisciplinary approach to arts education and production in the Arab world. Home Workspace houses Lebanon’s first public library for contemporary arts, as well as the HWP, an international arts program admitting 15 participants/year to study with some of the world’s leading artists, filmmakers, curators, thinkers and academics. Tohme, Christine. “Home Workspace: Christine Tohme in Conversation with Anthony Downey.” Interview by Anthony Downey. Ibraaz. Ibraaz, 2 May 2012.